I've recently discovered (hehe) a new nonfiction series published by Rosen Books: Graphic Discoveries. These books are certain to appeal to reluctant readers with their high-interest subject matter and graphic novel format. I definitely recommend them for recreational reading and I think the topics could definitely spark enough interest that kids might search out more books about the subjects. Each book starts with several pages of basic facts about the general topic. This is followed by three separate graphic novel stories about specific incidents. The book is then wrapped up with another couple pages of information (often including a map), an index, and a short list of further reading suggestions. 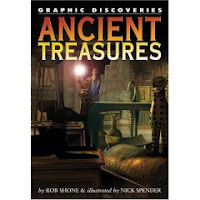 Ancient Treasures by Rob Shone and illustrated by Nick Spender is about fantastic archaeological findings. The first several pages explain how scientists and amateurs find archaeological sites and how they excavate artifacts from these sites. Then the graphic novel portion shows the supposed discovery of Troy, the excavation of Tutankhamen's tomb, and the discovery of the Terracotta Warriors in China. This is followed by a map of the world showing other fascinating archaeological findings. I could definitely see a kid's interest being sparked by one of these stories and them wanting to find out more about King Tut or Troy. I was a tiny bit disappointed, then, that the suggestions for further reading only included more general archaeology titles instead of anything more specific. In lieu of listing websites, a short note at the end of the book directs readers to one central website that is supposedly a frequently-updated list of links. Upon visiting the website, there were only two links listed, which was also disappointing to me. 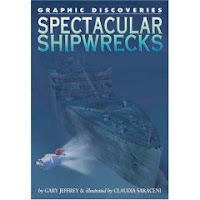 Spectacular Shipwrecks by Gary Jeffrey and illustrated by Claudia Saraceni starts off by giving information about how a ship might come to sink. It also provides a bit of background information on the three shipwrecks that will be examined in the graphic novel portion. This information is accompanied by photographs. In the graphic novel section, three shipwrecks are examined: the Tudor ship the Mary Rose, which sank in the 1500s; the Titanic; and the German WWII warship the Bismarck. The book ends with another informational spread (with photographs) that explains some of the process of recovering sunken ships and preserving the artifacts found within. This is another entertaining entry in the series and the topic is sure to appeal (I can't tell you how many kids come in looking for books about the Titanic). Other books in this series include Fantastic Fossils, The History of Flight, Medical Breakthroughs, and Incredible Space Missions. I will look for this series. Thanks! I'd not heard of the books before.